\r\nSubmit your site to over 14000 online services! \r\nThe ultimate tool that every SEO specialist don\'t want to give you! \r\nDATABASE UPDATED (2018-09-19): over 14000 sites available! \r\nWhy pay others if you can do the work yourself? \r\n- fully portable: to use the software just unzip the archive and execute the exe! 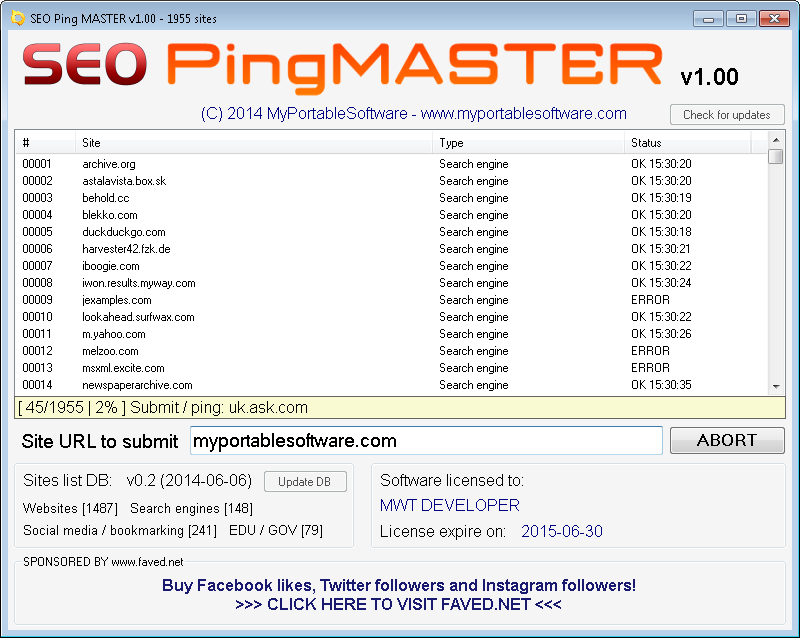 \r\nPing services notify search engines (like Google, Bing, Yahoo), blog and RSS directories that your site / blog has been updated. \r\nThis increase the indexing speed of your site. \r\nYes, some services present in the db create also a backlink to your site. \r\nIt\'s not simple to reply to this question some sites have reported an increment in traffic after some weeks, others after a month. \r\nFor any question, feature requests, bug report send us a message. \r\nOur developers will reply directly!